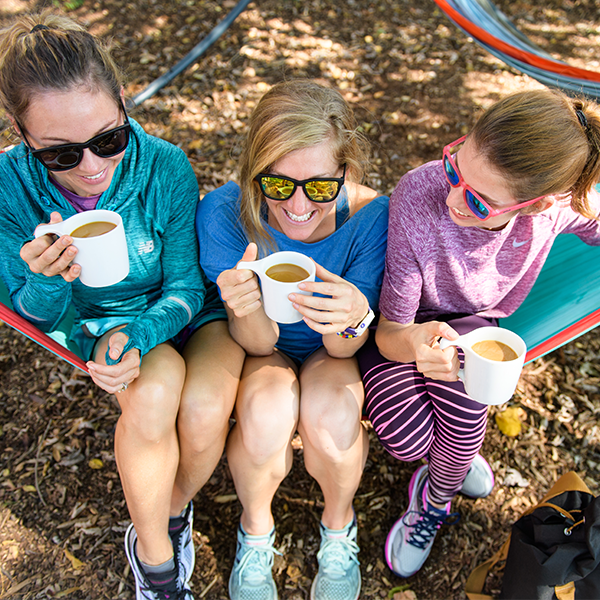 We boast that Chicago is the greatest running city in the world. City streets lined with a plethora of unique shops and trend-setting restaurants build the bulk of the scenery while the Lakefront Path provides a nice limestone path alternative with a stunning view. But drive 30-60 minutes outside of the city in any direction and you can also find your fair share of trails. 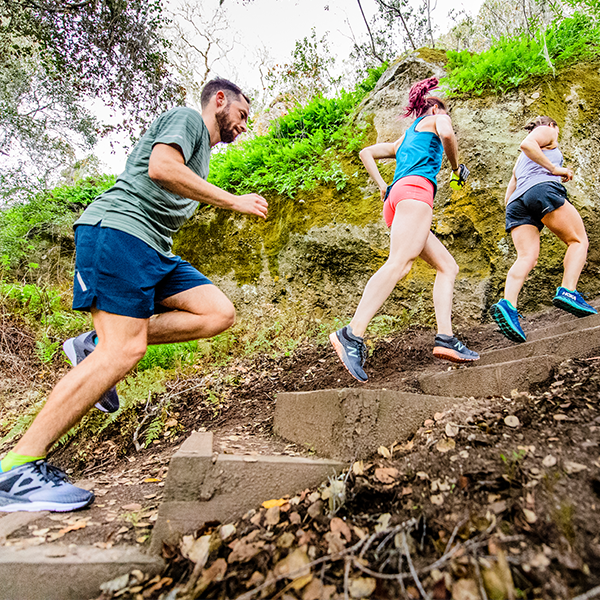 Real technical trails with a variety of terrain and surfaces to add some wilderness and nature to our runs that us urban dwellers often crave. 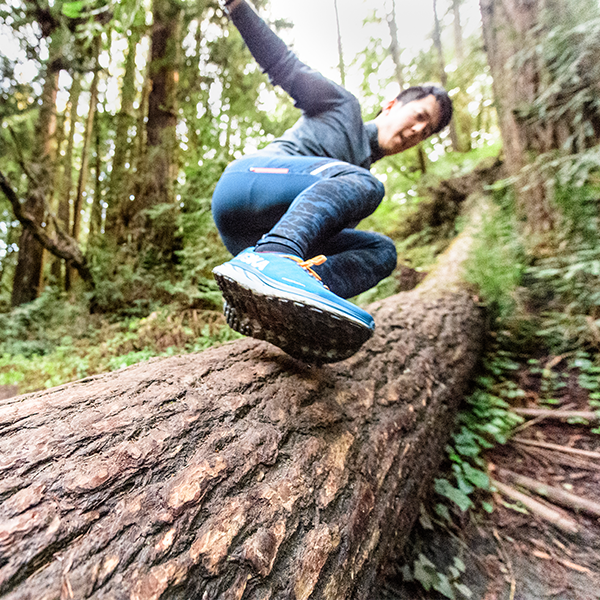 Make your next run an adventure. 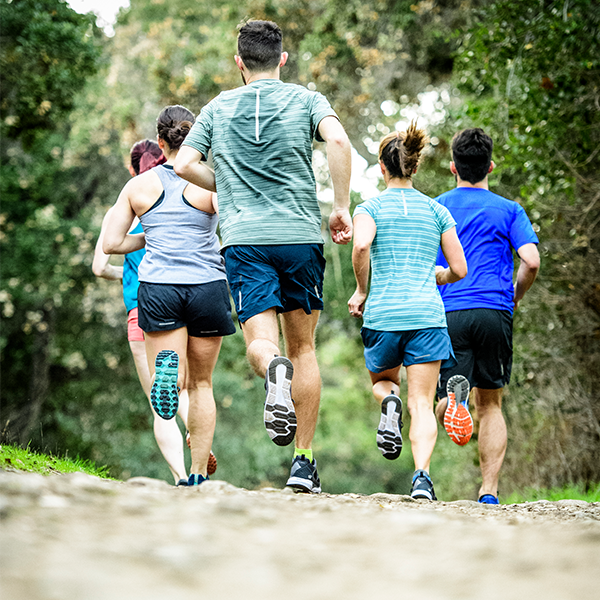 Explore this extensive list of Chicagoland running trails, sorted in alphabetical order, and get outside on one of these trails near you. Not your average "trail", the Bloomingdale Trail, part of “The 606” park system, is a 2.7-mile, elevated urban rail-trail on Chicago’s northwest side. Built on a former rail line, the trail sits nearly 20 feet above four of the city’s neighborhoods: Wicker Park, Bucktown, Humboldt Park, and Logan Square with bridges over all the city streets it crosses, and access ramps down to street level below. The Bloomingdale Trail has not only improved local parks, but also created community artwork displays near many of these lower access points. The Busse Woods Trail system is located within Ned Brown Forest Preserve, a 3,700-acre property in the northwestern suburbs of Chicago. There are 11.2 miles of paved trails for cyclists, equestrians and pedestrians. The main loop is nearly 8 miles, circling some lakes and meadows, while a couple of much shorter side loops will take you to the north and south end of the forest preserve. About 4 miles of crushed limestone trail across farmland with some interesting off-shoot trails and wildlife that connects the Millennium Trail and Des Plains River Trail. Located east of Lakeshore Drive, the Chicago Lakefront Trail is an 18.5-mile linear park along Lake Michigan that includes beaches, volleyball courts, playgrounds, baseball diamonds, tennis courts and soccer fields. The trail unites a variety of neighborhoods, including South Shore, Hyde Park, Lincoln Park and Lake View, and serves as both a recreational and transportation resource. The Chicago Lakefront Trail also provides direct access to a number of amenities popular with locals and tourists alike, and thus is often crowded on warm days. The Des Plaines River Trail and Greenway traverses north–south along the route of its namesake river along its course through both Lake and Cook counties. The corridor protects 85% of the riverine habitat in the county. The 56+ mile trail connects numerous forest preserves, parks and communities between the Illinois–Wisconsin border and south, well into the western Chicago suburbs. The Fox River Trail features 43 miles of spectacular biking, hiking and cross-country skiing along the scenic Fox River. The paved path can be challenging at times, but the extra pedal pushing is rewarded with some impressive scenery along the trail and in the small towns. In addition, you can link with other trails in the region directly from the Fox River Trail for a multi-day journey. Great hill workouts are available on these unkept single track trails on the Illinois side of Wilmot's ski resort. Within this preserve is Lake County's highest natural elevation. Gander Mountain tops out at 957 feet above sea level. The site's 125-foot hill is the result of deposits left from the retreating glaciers at the end of the last ice age. The eastern segment of the Great Western Trail in Illinois follows 12 miles of an abandoned railway corridor through DuPage County, between Villa Park and West Chicago. There are plans to extend the eastern segment of the Great Western Trail west of Route 59. The Chicago Great Western Railway (later Chicago and North Western) was called the Corn Belt Route because it linked Chicago, Minneapolis, Omaha and Kansas City. Today, the crushed limestone trail provides access for cyclists, walkers, joggers, equestrians and cross-country skiers. The western segment of the Great Western Trail in Illinois follows 17 miles of an abandoned railway corridor through DeKalb and Kane counties, between LeRoy Oakes Forest Preserve and the town of Sycamore. The Chicago Great Western Railway (later Chicago and North Western) was called the Corn Belt Route because it linked Chicago, Minneapolis, Omaha and Kansas City. Today, the crushed limestone trail provides access for cyclists, walkers and joggers. The 9-mile Green Bay Trail runs parallel to Chicago's Metra commuter rail line north of the Chicago city limits. Stretching through North Shore towns such as Kenilworth, Winnetka, Highland Park and Lake Bluff, the corridor is flanked by restaurants, shops, community parks and beautiful homes. Because the trail stays generally within a mile of Lake Michigan, you can take any number of on-road side trips for beachfront views of the lake. This trail system is a bit of a drive but it's worth it. The Ice Age National Scenic Trail is a thousand-mile footpath that highlights these landscape features as it travels through some of the state’s most beautiful natural areas. The Trail is entirely within Wisconsin and is one of only eleven National Scenic Trails. The Illinois & Michigan Canal provided the final link in the water route from the east coast to the Gulf of Mexico by connecting Lake Michigan to the Mississippi River via the Illinois River. Today, the Illinois & Michigan (I&M) Canal State Trail has preserved nearly 70 miles of crushed stone and gravel along the towpath of the original 96-mile canal as a multi-use trail. The Illinois Prairie Path (IPP) is one of the country's first rail-trail conversions. It consists of five connected trail segments with three main branches that converge at Volunteer Park in Wheaton. The 61-mile trail follows the historic path of the Chicago, Aurora and Elgin electric railroad. Beginning in 1902, the railroad provided passenger service from western suburbs into downtown Chicago. With the railroad in decline, many routes were transferred to bus service. The completion of the Eisenhower Expressway in 1955 spelled the end for this once mighty railroad: by 1959, passenger and freight service on the line were finished. Wide path trails on some rolling hills and varied terrain highlight Lake County's largest forest preserve. The Millennium Trail currently spans just over 30 miles in two disconnected segments, but there are plans to extend it to 35 miles and connect it to the Des Plaines River Trail. The trail goes through forest, farmland, and the suburban neighborhoods of Lake County. Though largely well marked with Millennium Trail signs, the route is intertwined with other trails throughout, so pay close attention to the signage. Set amongst Lake Forest's newer east side mansions, this 5 miles out and back crushed limestone trail runs through a beautiful savanna overflowing with wildlife - there's even an animal sanctuary (Elawa Farm) on the property that houses a bobcat. Beautiful new pedestrian bridge over railroad tracks connect the trail to Lake Forest Academy. The beautiful North Branch Trail is named for the North Branch of the Chicago River, along which it winds. At its northern end, the trail begins at the south end of the Chicago Botanic Garden and continues south to circle the Skokie Lagoons and Erikson Woods. It then meanders south through wooded suburbs, beside golf courses, and among open space to the forest preserve at Edgebrook in Chicago. The trail offers several resting areas and public restrooms. For much of the trail’s route, there are alternate dirt paths through the woods. A hidden gem on Chicago's northwest side. The North Shore Channel Trail extends from the junction of Green Bay Road and McCormick Boulevard in northern Evanston to the junction of Lawrence Avenue and Francisco Avenue in Chicago. All but the last 0.25 mile runs alongside the North Shore Channel of the Chicago river. The 22-mile Old Plank Road Trail travels over the original Michigan Central Rail Road (MCRR) line, a railroad started about 1850 that ran from Lake Station in East Gary to Joliet. The rail was nicknamed the “Joliet Cut-Off” because it enabled trains to skip Chicago. Originally a Native American transportation corridor, the route was used occasionally by traders, trappers and missionaries. Later, European settlers used the pathway to find their own homesteads. Today, the oncoming traffic is more likely to be a pack of retired cyclists zipping by, or parents with strollers. Trail Surface: Dirt single and multi-track, asphalt. Near the junction of I-55 and I-294 is the trail running Mecca for the Chicago area—The Palos Trail System. Technically it’s several forest preserves that are part of the Cook County Forest Preserve system, but to anyone who enjoys running off-road, you only need to know one word: Palos. The 25-mile trail system in the preserve features nine trails of varying degree of difficulty, with plenty of singletrack mixed in with some multitrack roads. 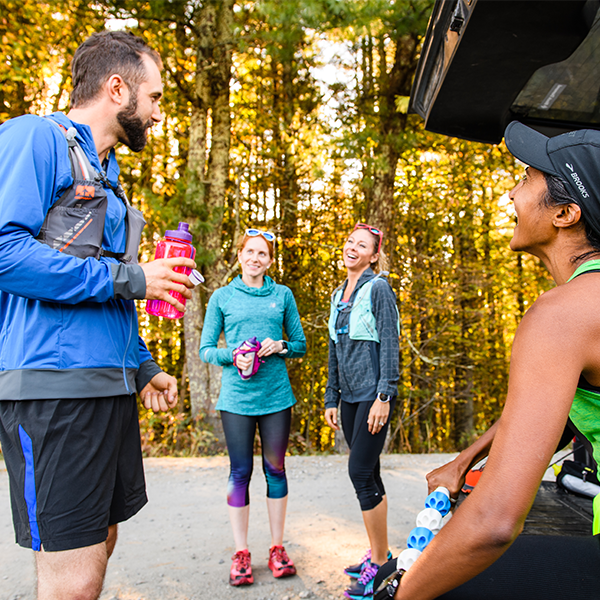 This is the best place to truly take advantage of actual trail running just a 30-minute ride from downtown—at least when there’s no traffic early mornings on the weekends. Palos offers plenty of hills to test the mettle of those who do most of their training on the Lakefront. The Robert McClory Bike Path is notorious for its conglomeration of names over the years. At any given time—and depending on whom you ask—it has been called the Green Bay Trail and the North Shore Bike Path, although those names now refer to separate trails in the area. The trail’s formal name, given in 1997, honors a bike-friendly government official. The Green Bay Trail now generally refers to the southern extension of the Robert McClory Bike Path to Wilmette; the two are seamlessly linked in Highland Park. The path strings together the communities of Highland Park, Highwood, Fort Sheridan, Lake Forest, Lake Bluff, Naval Station Great Lakes, North Chicago, Waukegan, Beach Park, Zion and Winthrop Harbor before seamlessly melding into the southern end of the 18.6-mile Kenosha County Bike Trail at the Wisconsin state line. Rollins Savanna is one of Lake County's largest forest preserves with 1,220 uninterrupted acres. Scattered groves of large oaks, wide-open prairies teeming with wildflowers and native grasses, and abundant wetlands offer the perfect setting for grassland birds and other wildlife. The Salt Creek Trail travels nearly 27 miles from the Brookfield Zoo to Busse Woods Forest Preserve. Along the way it connects several beautiful county forest preserves and other woodland areas. Portions of the trail are paved, while others have a limestone screening, and a few sort segments are an on-road route. It is well marked throughout, although take care at some junctions, which can confuse. The Salt Creek Trail intersects the Illinois Prairie Path in Villa Park, and follows it for a short stretch around State Route 83. The Skokie River Nature Preserve contains four miles of unmarked grass trails of green bliss with quirky architectural and sculptural landmarks. It consists of a mix of woodlands, savanna, prairie, and sedge meadows typical of the bottomland areas of the Skokie River valley. Thorn Creek Trail is currently open in three disconnected segments. All three are paved and travel through woodlands abundant with wildlife. The northern section stretches 4.6 miles through the Wampum Lake Woods Forest Preserve in Glenwood. The southern section, in Chicago Heights, traverses 4.7 miles through the Sauk Trail Woods Forest Preserve. The third section is nestled between the two, traveling down Glenwood Woods for 3.5 miles. The Tinley Creek Trail is currently in two segments. This northern segment stretches from Palos Heights to Oak Forest and largely falls with several Cook County Forest Preserve areas, including Rubio Woods, Burr Oak Woods, Turtlehead Lake, Bachelor Grove Woods, Nelson Woods and St. Mihiel Reservation. 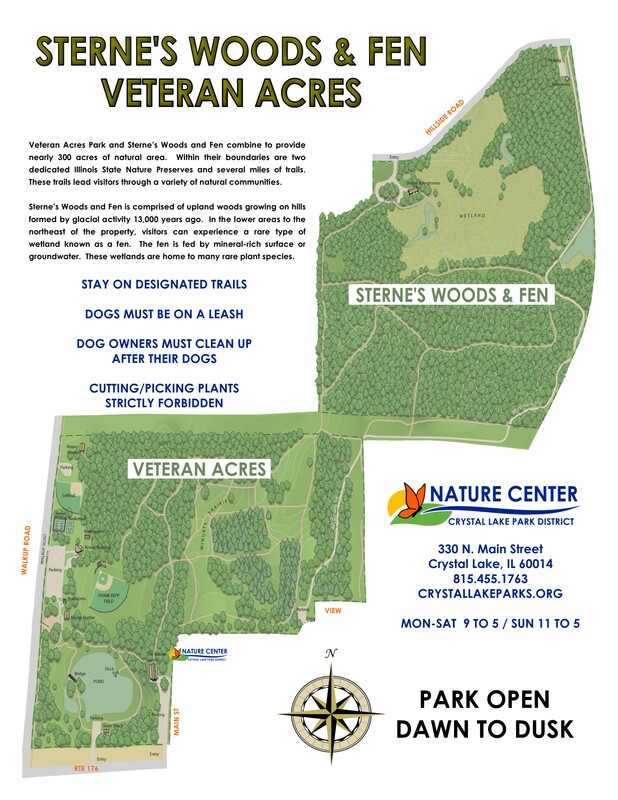 Passive recreation lovers enjoy groomed cross country ski trails in the winter and hiking trails through natural areas including Sterne's Woods and Wingate Prairie, an Illinois Nature Preserve. McHenry County Conservation District's Prairie Trail also winds through Veteran Acres. The trail system in Waterfall Glen Forest Preserve makes a loop around the entire park. The preserve is geologically significant, featuring glacier-carved rock ridges, ravines and wetland potholes, which are not found anywhere else in the county. The 700-acre forest is a contiguous wooded acreage interspersed with dolomite beneath a prairie habitat, home to rare plants. As you explore the limestone-surfaced trail, you'll discover the woodlands with dominant oak and maple trees, as well as prairie and grassland habitats and planted pine groves. You're likely to see lots of wildlife here, too.